Nose Creek Web Design Airdrie: Quality, Affordable Website Design in Airdrie, AB. Today's world revolves around the internet. It is important for any business to have a presence in the online community. Even a simple one-page site can be an effective way to let your customers know how to contact you or to help them get a better idea of the types of services that you offer. Nose Creek Web Design can help build a vibrant online presence for you business. Contact us for more information. 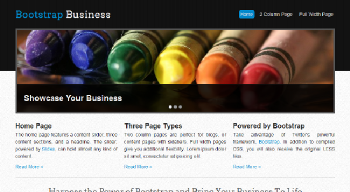 We do custom web design, working with you to create a site that will showcase your business in the best way possible. For the budget conscious small business, we also offer deployment of pre-made templates. All sites are built on top of the WordPress platform, a powerful piece of technology harnessed by many of the internet's most visited sites. Contact us to get started today! In addition to new site design, we can do updates, additions, and maintenance for existing sites. Whether you are looking for a complete overhaul, minor tweaks, or just periodic content updates, we have a solution for you. We also offer Search Engine Optimization (SEO) and mobile website development. Find out more or contact us and let us know your specific needs! 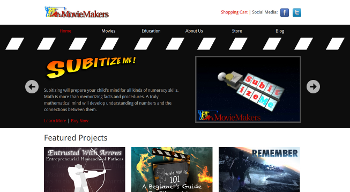 MovieMakers is an Airdrie based family business. Nose Creek has created all aspects of this site. Features include a blog and a robust online store. The site contains many videos, which are played using the VideoJS for WordPress plugin, which was developed by Nose Creek Web Design. 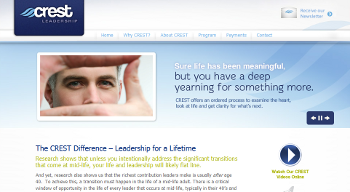 Nose Creek Web Design has been the webmaster for CREST since the Fall of 2010. Numerous tweaks to the site have been made in that time including the addition of a blog, a new sub-navigation menu, a video library, and a custom WordPress plugin to allow the site owners to easily recommend resources to their customers. 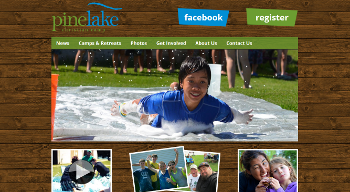 Pine Lake Christian Camp, located near Red Deer, AB, is a fun place for kids, teens, and families to experience God. Website features include: Wufoo intergration for easy online camp registration; a responsive design that looks great on phones, tablets, laptops, and desktop computers; a photo slideshow on the home page; and so much more! 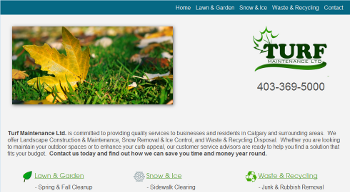 The Turf Maintenance website was designed and created by Nose Creek Web Design, working closely with the business owner. The site is user friendly, with information on all aspects of the business available in only one click. Be sure to contact us with your specific needs. Contact us using the information below or the form on the right sideat the bottom of the page. Please note: Nose Creek Web Design is not currently accepting new clients. If you are contacting us because you are interested in having a website designed, please include as many relevant details as possible, including: timeline, budget, and any desired site elements. If you are unsure about any of these things, don't worry - we will be happy to help you out. If you would like work done on an existing site, please include the URL of your current site. ©2012-2019 Nose Creek Web Design. All rights reserved. 403.370.2313. Airdrie, AB Canada. Find us on Google+.